It is clear this data proves that there is a case for conscious business, BUT we believe you have to communicate your position as a conscious business in order to fully realize these statistics. Simply being a conscious company is great, but you won’t actually realize the full impact of your mission or purpose if you don’t get the word out and connect people to you. There are the obvious social, economic and environmental benefits to being a mission-minded business, but in order to truly differentiate yourself and build loyalty among your stakeholders, you need to be telling your story and connecting people to your cause. First, understand your audience and identify the communication channels where they receive news and information. Then, host a brainstorm to identify concepts, themes and topics that resonate with your audience. 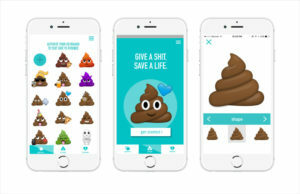 For example, WaterAid’s #GiveaShit campaign tapped into the popularity of the poop emoji to intrigue it’s audience and educate them about global waste issues–pretty creative huh? Once your theme is identified, use it to inform all the communication and messaging across your platforms. Then, build your marketing plan around that theme. Next, outline the channels you will focus on, how you will engage audiences, write down key messages you want weaved throughout each platform, and always ask yourself: why are we doing this marketing campaign in the first place? Then, identify the specific tactics associated with each strategy. For example, if one of your strategies is thought leadership, tactics associated with that strategy include developing a speaker one-sheet, researching speaking opportunities, creating a relevant speaking engagement opportunity matrix, and pitching organizations for speaking gigs. Finally, your marketing plan should outline a reasonable timeline, budget and delegation of duties for each initiative. When developing a marketing plan, remember that every strategy needs to have a purpose. Don’t do a social media campaign if it’s not where your audience is getting their information OR because every other social enterprise is dappling in it. Don’t do a thought leadership campaign if you don’t have the people and resources needed to truly make it successful. Don’t spend time and energy writing a press release and sending it to editors and journalists if you don’t truly have news or a good story to share. WHAT is the story you want to tell, or have others tell, about your company and the social, economic, or environmental problems you’re working to solve? WHO do you want to tell these stories to? WHO do you want to spread the word on your behalf? WHAT do you want people to think about after they hear your story? WHAT do you want them to do? WHERE should these stories be told? Consumer, business, industry publications? Conferences or events? Your website and social media channels? Through strategic partners? WHEN should these stories be told? How often? HOW are you going to tell these stories in a meaningful way? Identify strategies that are reasonable based on your resources BUT don’t be afraid to tackle new initiatives that you haven’t previously explored. Now that you have outlined your plan and every stakeholder is on board with the campaign, it’s time to get to work and get the word out there. Media outreach is a great place to begin. The best place to start is to create a series of documents for reporters and editors who cover campaigns and stories like yours. Documents like fact sheets that detail info about your cause and impact, editorial backgrounders, bios of key players in your organization and key messages will help tremendously. All of this info should tell a story about your campaign and provide your media contacts with ALL the information they could possibly need to write a story. Data, facts, testimonials, research, and answering the “why are we doing this in the first place” question are key. Once your documents are created, it’s time to write a press release/media advisory about the launch of your campaign. You can share your release via paid or free newswire services depending on your budget. Paid newswires like PRNewswire allow for hyper-targeting of reporters and geographic regions vs. free newswires like PRLog help when people are searching for information about your campaign. Create and execute a social media plan (if appropriate to your campaign). Nowadays, social media is a must for almost all purpose-driven, nonprofit and socially-minded organizations. It’s where their new generation of supporters are getting information and it’s a place for people to come together and rally for your cause. Your social media plan should include draft posts, hashtag research for platforms like Instagram and Twitter, and detail how you will customize each post per platform. Target online directories to list your campaign IF you have a public event-component to your campaign. Community calendars and news calendars are great places to post information about your campaign event to invite the general public to attend. If your event is private, you’ll need to email specific invitees and note in the invitation that it’s not open to the public. Develop a solid inbound marketing program. Inbound marketing is basically marketing efforts where people come to you based on the content you distribute vs. you pushing out content via advertisements. Try producing a series of blog posts about your campaign, write contributed blogs on complementary organization’s platforms and create videos to inspire people to learn more about your campaign and mission. You won’t know if you have a successful campaign without knowing what to measure and how to measure efforts. Tools like Coveragebook allow you to easily log media coverage and measure impressions quickly. Google Analytics will reveal all kinds of information including website traffic, where traffic came from, what people searched for online, etc. You can use this data to see how your communication materials and media coverage impacted your web traffic. Same for social media. Facebook Insights, Twitter analytics, and Instagram all have built-in metrics to help you “see” how your campaign impacted your digital presence. Some metrics aren’t always quantifiable. Qualitative metrics are also important to recap in your final report. Think about the “big wins” with your campaign – maybe you had some amazing social media conversations that inspired people to get buy from you or perhaps you received a compliment from a new donor or volunteer. Those highlights should not go unnoticed. Communicating your story as a conscious company is complex. There are many factors to consider beyond a simple “spray and pray” approach. Remember, it’s one thing to be a conscious company, but it’s something else entirely when you can communicate your impact and connect people to your cause – that’s how real change happens.